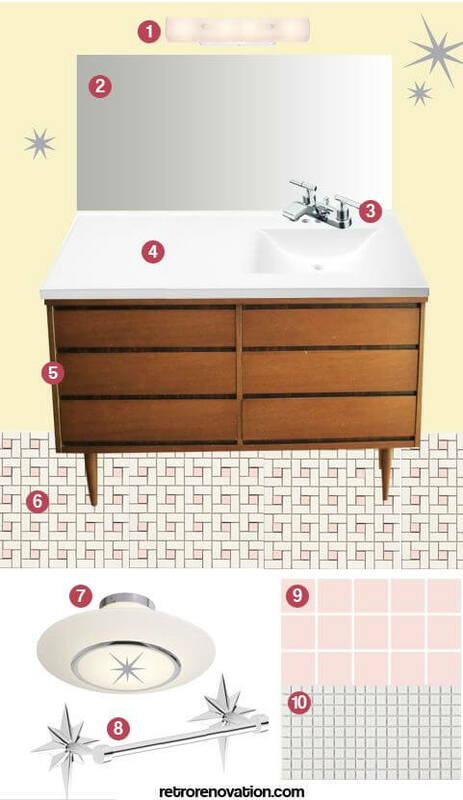 Above: The current layout of my retro bathroom. As you can see, there is quite a lot going on in this layout. I can say for the first time in my life, that there is too much closet space in my bathroom. We can fit nearly everything we need in the small closet — the large closet is mostly empty. There are also doors banging against doors everywhere. The small closet door interferes with the shower door, and the large closet doors can only be fully opened when the main bathroom door is shut. Since I have so much extra closet space in this bathroom, I’ve decided to take out the small closet to expand the shower. 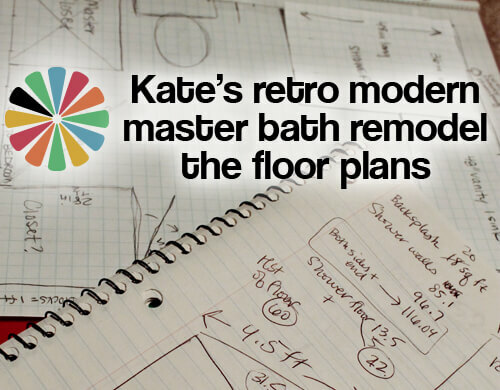 That way, my tall, broad shouldered husband can have the larger shower space that he would like, and I don’t have to move the plumbing for the shower — which would add extra costs to the overall project. I’m also going to keep the toilet in the same place for the same reason. The only plumbing that will need to be moved will be the sink lines and sink drain. Above: This is the plan for the new master bathroom layout. The new layout removes a lot of the clunkiness of the original floor plan. Yes, there are fewer closets, and the vanity is smaller, but the space is so much more user friendly this way. The shower will not only be larger, but also will have a curtain (the squiggly blue line) instead of shower doors — oh how I will love not having to clean shower doors! Once you exit the shower, there will be ample room for one large bath mat. Two towel racks (one for each of us) or one large towel rack will be within easy reach, no reaching around a shower door to grab them. You’ll notice that the new plan still only has one sink. That’s because two sinks are twice the cost (extra plumbing, extra sink and extra faucet), and I like having plenty of counter space to use when I am getting ready in the morning. I offset the sink to maximize the counter space and also because of the style of vanity that I’ve chosen — but more on that later. 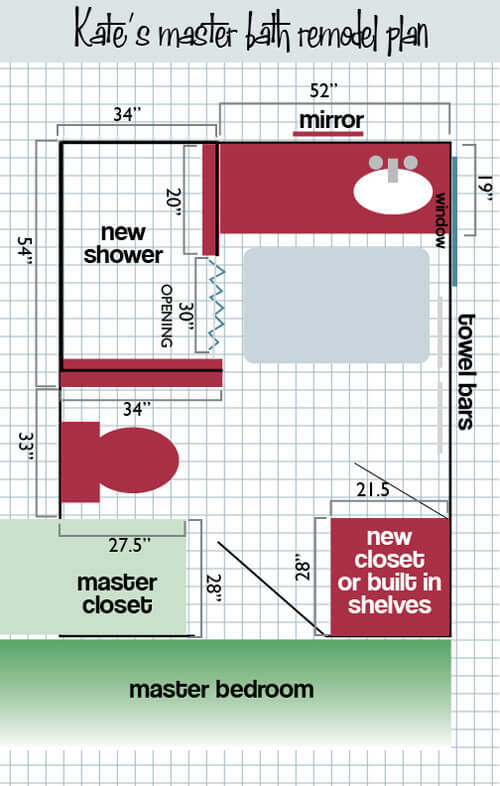 The last new feature of this bathroom is consolidating the two closets into one small closet. I’m also toying with making some built in wall shelving like Pam made in her crazy crafty epic big fat retro office remodel. 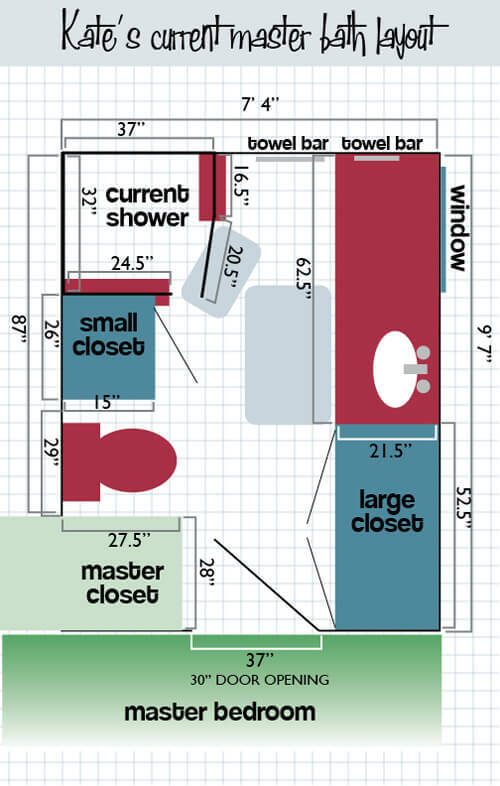 So there you have it folks, after much deliberation and nearly two years, I feel sure that this is my new master bathroom layout. Of course, that is only part of the job. 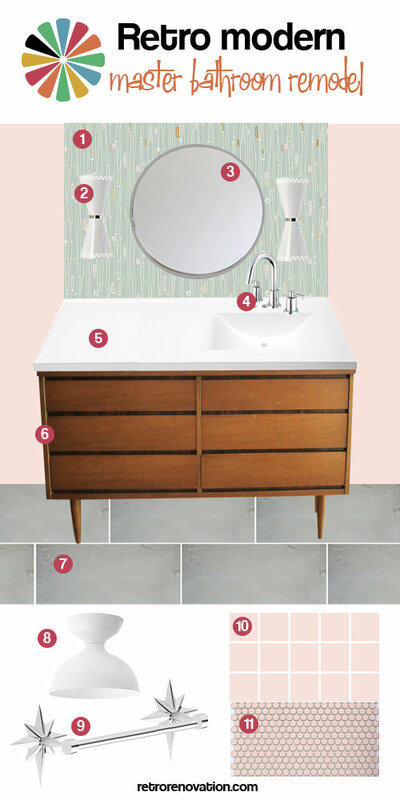 I’m still working on the fun part — how to blend retro and modern styles into one happy, perfect for us master bathroom. More on that next time! 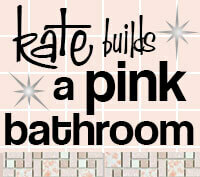 Follow all of Kate’s stories about her master bathroom remodel — Click here. my 2 cents… I really like having towels (towel bars) reachable when I am still standing (dripping) inside the shower (i.e. not so far away that I have to step out and stand on the bath mat to reach the towels). We had this issue with our master bath — is it new construction we added on the house, but because of the layout, there wasn’t room for towel bars right next to the shower. We put a hook on either side of the shower door, and we just move our towels to a hook before we get in the shower. Then, after we dry off, we hang the towels on the bars to dry. this is exactly the suggestion i was going to make! hooks right next to shower are very important. that doesn’t have to be where they dry out, but i hate having to put my towel in some weird spot or on the floor so that it’s reachable from inside the shower. even if you only did half walls on the shower (glass on top), you could put a hook on that at the entry. i’ve just gutted my main bath and am looking forward to enjoying my new bath next month! marble floors (with heat), white subway wainscot and bath surround, boomerang laminate on vanity. sooooo excited. i luckily didn’t have to move anything, but i did have to have a custom vanity made, though i saved by reusing my sinks, toilet and bathtub. Just a few comments from someone old(er). I don’t see why everyone thinks the shower size is an issue; just turn sideways for more elbow room. 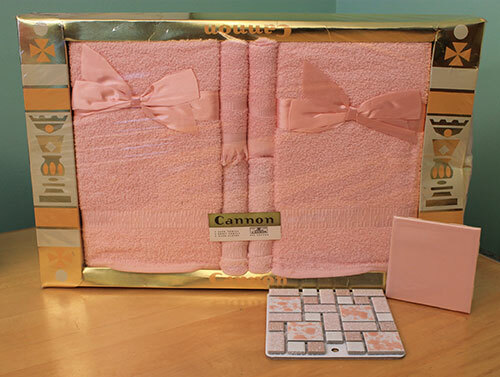 The planned shower is 50″ long!!! I love the idea of your repurposing an item for the vanity 😉 I don’t think you need 2 sinks. You could use the money saved for something else. In my 31 years of marriage I have never even had a “master” bath, let alone double sinks. I am like you; I would rather have more counter space.You do have another bath if there is an urgent need to brush teeth STAT. I think grab bars are a good idea and would install them now instead of having to do it later at an unplanned time. One of you may need them sooner than you think. I do agree you need an hook for a towel outside the shower door. If you don’t plan to move/sell anytime soon then do what YOU want. You have lived there long enough to know your needs, wants and how to best utilize your space. I am looking forward to watching your progress! I agree, two sinks is not necessary. My husband and I have been sharing one sink for 6 years (3 of which were married years) and we have yet to have an issue. Both my parents and his parents have always shared one sink as well. I know it is a personal preference thing, but for us, two sinks just doesn’t make sense. If you shave your legs in the shower, make sure it includes a low shelf or bench so you can prop your leg up. That way, you’re not bending double, blocking the light, and having all your shaving lotion washed off by the water cascading down your body. We put one in our shower when we added a master bath and I am happy about it every time I shave.